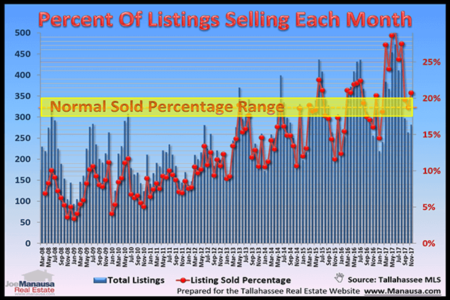 As the annual Summer selling season is drawing to a close, it's time to examine Tallahassee real estate supply and demand to see how each area of the market has evolved. 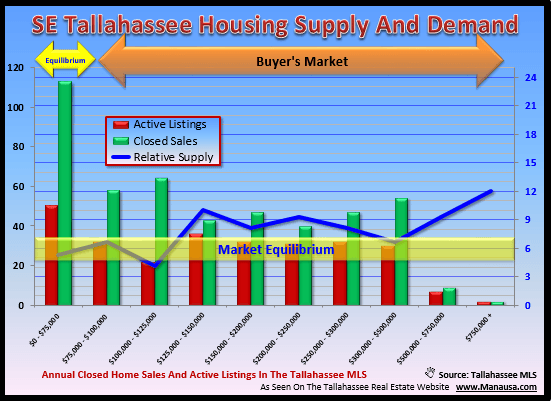 An important issue for both buyers and sellers alike is how the balance of supply and demand has changed, and it prudent to do so by each quadrant of the Tallahassee real estate market. The conditions for home sellers in NE Tallahassee are far different than those for sellers in the SW, and buyers will find very different opportunities in each area. In each of the graphs featured in today's post, we examine the current supply of homes (red bars), the past twelve month's closed home sale (green bars), and the corresponding relative supply of homes (blue line). The relative supply of homes, measured in "months of supply" is shown for each price range. When the blue line sits in the middle of the yellow shaded region, we say that the price range is in equilibrium, or "balance." When the blue line is below the yellow field, it is a seller's market, while the opposite is true when it falls above the yellow field and is deemed a buyer's market. 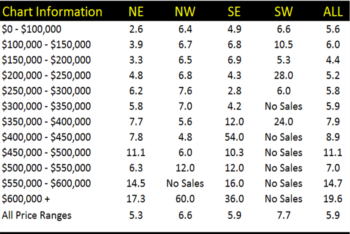 The best looking quadrant in Tallahassee can be found in the Northeast, where the market has approached "normal" in many of the price ranges. Homes priced below $100,000 in Northeast Tallahassee are rare, and are in high demand. This is clearly a seller's market. Homes priced above $150,000 are still in a buyer's market, but the supply and demand is close to equilibrium for homes priced up to $250,000. Once we reach the the higher end of the price ranges though, the market is still very much favoring buyers. 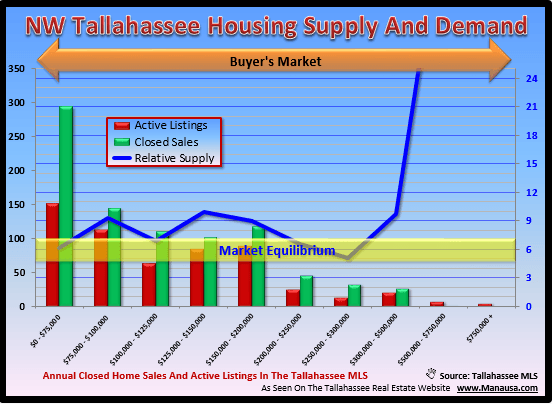 Northwest Tallahassee still suffers from a gross over-supply of homes. Right now, homes priced between $200,000 to $300,000 in NW Tallahassee appear to be in balance, as are homes priced below $75,000. But all other price ranges are so competitive among sellers that there are some steals to be found if you are an active buyer. Southeast Tallahassee is in balance for homes priced below $125,000, but there is still too many homes available at all price ranges above that level. 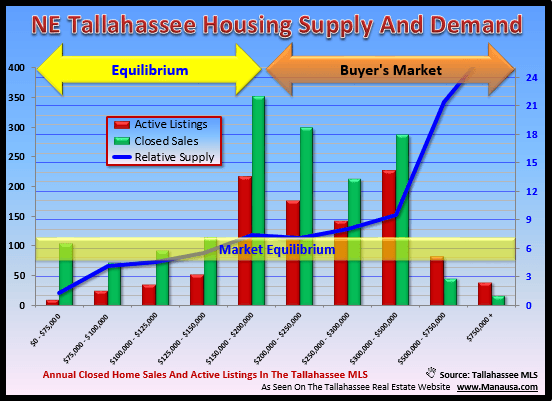 Note the level of imbalance is far better than what we observed in the NW, with SE Tallahassee homes priced between $125,000 and $750,000 holding less than one full year's supply of homes. Supply and demand for homes in SW Tallahassee is a train wreck. 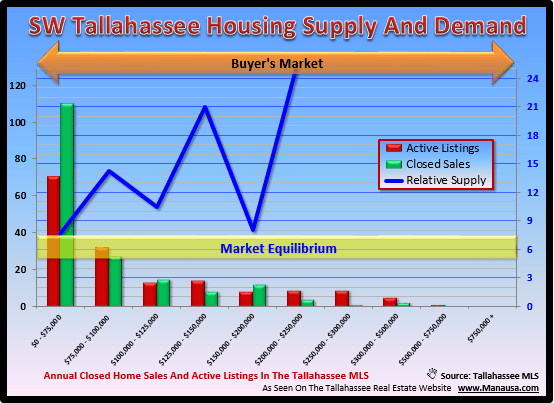 With nearly zero buyer activity for homes priced above $200,000, SW Tallahassee still has a long way to go before we will see the market return to a balanced level. Too often, people start the process of buying a home by looking at homes online and then asking to see the ones that look interesting. While I think it is a wise move to use our online property search tool, I think buyers who want to ensure they do not over-pay for a home either take the time to really learn more about market conditions, or at a minimum they should choose to work with a well-trained real estate buyer's agent. If you would like to know more about buying a home in Tallahassee, you can register for our FREE e-series "Home Buying For Smart People," as it will guide you through the preparation necessary to ensure that you get the best deal possible when you buy your next home.